Jackson Pollock, the towering American artist who was to revolutionize twentieth-century art with his "dripping" painting technique, grew up between the late 1920s and the late 1940s, the youngest of five boys born in the American West. Though often apart, whether they were traveling for work or for studies, sons and parents kept in close touch through their regular exchange of letters. Their correspondence offers an invaluable insight into the formation of one of America's most influential artists, but it also draws a unique portrait of America itself between two momentous events in its history: the Great Depression and World War II. These letters - many of which are published for the first time in this volume - show that the Pollock brothers took a keen and early interest in art and politics. Their interest in painting was stimulated in part by Thomas Hart Benton, then a teacher at the Art Students League in New York, whose passion and commitment was to influence them profoundly. Jackson followed his oldest brother Charles to New York to study with Benton. While Charles subscribed to many of his mentor's left-wing beliefs and remained determined to bring art and social justice together, Jackson was far less committed to this ideal - he enjoyed life and traveled across America, hitting the open road and jumping from train to train, finding himself thrown out of school and even ending up in prison for a day, prodded on by his pronounced mystical leanings to search for his own way to express his artistic intuitions. Through this vivid, lively and often moving correspondence from an atypical yet very American family, we catch a novel glimpse of Jackson Pollock the man, as well as of the various artistic schools and debates that established what has now become modern art. This remarkable volume will be enjoyed by anyone interested in Jackson Pollock and modern art, as well as anyone interested in twentieth-century America. The volume includes original works of art by Charles Pollock and an Introduction by Michael Leja, an expert on Abstract Expressionism and the work of Jackson Pollock. During his lifetime, Pollock enjoyed considerable fame and notoriety; he was a major artist of his generation. "The letters are hugely evocative and some of them sound as though they could have been penned by Jack Kerouac, so throatily do they capture the hobo spirit and the dispossession of an America in breakdown." "American Letters: 1927-1947 shows just how varied the American dream really was (and is) for those born without the silver spoon...[it] is a great book because of the calm and humane way it reveals from the inside the struggle of ordinary, talented people to make their lives better and culturally enriched (and how we should never lost sight of that), but also because it highlights the world out of which a great artist such as Pollock was formed." "Reflects the mix of bust and boom, fraught activism and disenchantment with Socialist art that American abstraction grew out of." "It would be hard to match the book as an account of this unusual family in its own varied voices, grounded in the larger struggles of the Depression, the shifting, sometimes dumbfounding politics of the Communist Left, the travails of an indispensable government arts programme, and the dilemmas of one driven artist who would take, it seemed, forever to find his way." "American Letters lets correspondence narrate two arduous decades, making us keenly aware of the way the five Pollock brothers were deeply supportive of one another during an era when mere survival wasn't always easy." "Their descriptions of current events, anxieties about employment, and their shifting (and sometimes conflicting) political views offer vivid details about the general environment in which Jackson was living and working during this period ... The letters also introduce a warmth and affection that offsets assertions by past biographers of resentful and estranged relationships within the Pollock family." 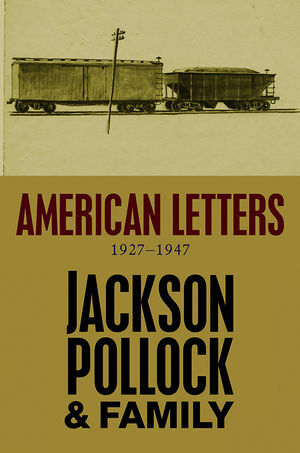 "Though American Letters's value is not limited to Pollock scholarship, its most profound achievement is that it provides an unabashed view of the intellect behind the work. By giving us new evidence of Jackson Pollock's own voice, American Letters achieves both, to offer an important new source for understanding his struggles and genuine search for meaning in life and art, as well as to (what Charles Pollock called) 'keep the record straight.'" "The letters with which the scattered family kept in touch across the US provide a vivid account of the lived experience of thoughtful people over two turbulent decades." "A fascinating volume that sheds light in particular on the Depression years in the US and some of the intellectual and artistic trends that emerged during that harsh era." "American Letters is no doubt intriguing for the artistically and politically inclined. Regardless of personal interests, however, the book presents five lives lived with self-reflection and cultural cognizance. The 21st century has fostered a world of expedience in which it is easy to forgo inconvenient communication. American Letters illuminates the importance of thoughtful interrelations, telling a classic American story along the way." "Bears witness to the hardscrabble reality of the artist's upbringing amid boxcars and barren homesteads - the incubator of his creative vision." "This extraordinary book is more than a fascinating collection of family stories - though it is surely that. It also casts unprecedented light on the young Jackson Pollock, and on the intersections between politics and the arts in mid-twentieth-century America." "Spanning the years from 1927 to 1947, these letters between members of the Pollock family, along with some notable figures from the period, bring the Depression and war years vividly to life. This book is of interest not only for scholars of Pollock, but for anyone curious about the material, social, and political realities of the Depression and war years - it is an utterly compelling chronicle of private lives and public events. We find here the soil which nourished Pollock's art, as well as a great deal more about the emotional and political grounding of this great painter." "These letters are extraordinary, not only because of the events to which they so pointedly bear witness or the remarkable bond they manifest between all the members of this family, scattered as they are across the US while in search of a job, but for the relentless cultural and artistic aspirations of their authors throughout times of extreme financial distress. There are moments of anger, or despair at the political situation, but overall it is a shared conviction that the world could be made a better place both by art and by political activism, or by the joining of the two, that lies at the core of this amazingly rich correspondence. This vast trove gives us a detailed picture of what it was to be an aspiring artist in poverty-stricken America during the 1930s. It should be a must-read for anyone interested in the socio-political context from which American modernism emerged." This book contains the previously unpublished correspondence between Jackson Pollock - the great American artist who revolutionized 20th century art - and the members of his family in the period between the late 1920s and the late 1940s. The letters provide a rich and detailed portrait of the influences that shaped one of America’s most influential artists and they show that the Pollock brothers took an early interest in two major themes - art and politics. The letters also offer a unique view of America itself during one of the most momentous periods of its history, as it deals with the Great Depression and its aftermath and becomes embroiled in the Second World War. The book includes original works of art by Charles Pollock and a new Introduction, specially commissioned for the Polity edition, by Michael Leja, a leading expert on abstract expressionism and the work of Jackson Pollock.